PITTSFIELD — Tim Durrin had an epiphany as he sailed down Sheffield’s Cooper Hill on his bicycle in the summer of 2006. “I was overcome by this overwhelming sense of joy as I was coming down this long, gradual hill,” the Housatonic man said. serve his country, but later came to question his military mission. really wanted to do with his life: travel the world and help people. 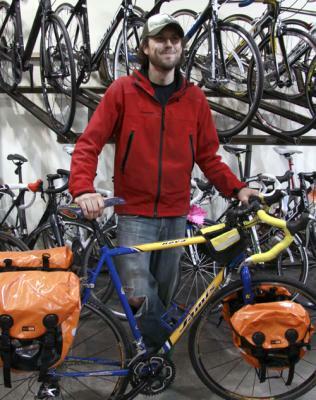 to others and riding his bike — some 5,000 miles this year alone. He joined the antiwar group, Iraq Veterans Against the War, and came to view the war as unnecessary and unjust. joined the Army. I knew I didn’t have college on my mind at that point, and I knew that I wanted a sense of purpose,” said Durrin, whose grandfather and uncle were both military men. “I think a lot of why I joined was, I was really young and naive and uninformed at the time,” he said. in love with the region’s culture and countryside. “That will be my launching site,” he said. from them, not proselytizing and preaching the American way, he said. “I want to be very humble and learn from them first, and then help them in a non-invasive, non-Western way,” he said. “I’ll go where I’m needed most,” said Durrin, adding that he’ll remain flexible — and purposeful — throughout his journey. His tentative plan is to work with high school-age students who already possess a decent grasp of the English language. “If [students] need laptops, I’ll get them laptops,” he said. trying to raise as much money as possible before leaving next month. Durrin spends much of his free time. in Massachusetts can follow his efforts. for the night, he said. “They’re sponsoring me,” he said of the Great Barrington bike shop. For anyone who knows Durrin, his desire to help and learn from others is part of his overall character. “We could all learn something from the selflessness of this trip,” Diaz said. A going-away party for Durrin is scheduled for 8:30 p.m. on Dec.
17 at the Gypsy Joynt, a Route 7 restaurant in Great Barrington. The party will feature local musicians, disc jockeys and artwork, as well as raffles and gift certificates.